Four years to the day after 10-year-old Lindsey Baum vanished in McCleary, her mother, Melissa Baum, was posting flyers in town with an age-progressed photo showing what Lindsey Baum may look like today. "Just to point out to the public she's not a little girl anymore," Melissa Baum said. "She's a young woman, and she's not going to look exactly like she did when she disappeared, she's going to look different." The age-progressed photo was done by the National Center for Missing and Exploited Children. Melissa Baum helped by contributing photos of herself and Lindsey Baum's father when they were roughly the same age. Baum said the image offers a new hope and also heartache. "Just seeing it reminds me of how much time I've missed with her," she said. Since Lindsey Baum vanished, the Grays Harbor Sheriff's Office has checked out 4,000 tips and interviewed nearly 40 people of interest, but investigators have never found anything that leads to her. 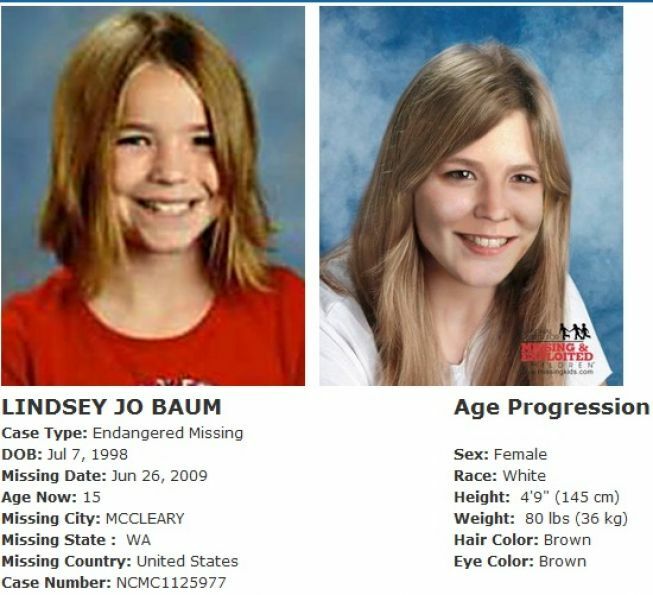 MCCLEARY, Wash. — It has been four years since the disappearance of 10-year-old Lindsey Baum and investigators still have no idea what happened to her. Lindsey disappeared walking home from a friend’s house in McCleary. On Wednesday, family, friends and volunteers held a balloon release in her honor. They would rather be somewhere else, rather have Lindsey home and for the last four years not to have happened, but it did. “It’s a tough day. I mean four years is a long time and she was 10 when she disappeared; she’s going to be 15 in 11 days,” Lindsey Baum’s mother, Melissa Baum, said. For Melissa Baum, it has been four years of suffering, crying, praying and wondering about what happened to her daughter. She says she’s never given up hope. “I’m just very convinced my daughter is alive. I’m aware of the possibilities, but I have always believed that — that she’s alive and she’s going to come home,” Baum said. “We don’t have any evidence that will support that she was abducted by a stranger. We don’t have evidence that supports that she was abducted by an acquaintance. We don’t have evidence that would support a belief that she is the victim of an incident or an accident and we certainly have no evidence that she’s the victim of homicidal violence,” Scott said. So from a hopeful mother and determined investigators, there were two messages on this day. “I would like Lindsey to know that I will never give up and I will be waiting for her,” Baum said. “To the person or persons who are responsible for this; it’s not over. We haven’t gone away. We’re not packing up our tent and going home. We’re going to continue to work this case,” Scott said. Police are still asking for help. If anyone knows what happened to Lindsey or if you think you see her, call 911 right away. Today marks 4 years since 10 year old Lindsey Baum went missing from McCleary. Now 14, the investigation continues both on a local level and with national attention. Search warrants have been served on multiple buildings in and around McCleary, and Lindsey’s story has been told on numerous TV shows. Lindsey’s 15th birthday is July 7th. She went missing while walking from a friend’s home late on June 26, 2009. Grays Harbor Sheriff Rick Scott said that the case is by no means cold. A team of investigators continue to work on finding Lindsey. That task force contains investigators with the Grays Harbor County Sheriff’s office, FBI, State Patrol Missing Persons Unit and the Department of Corrections. Scott says that no suspects in the case have been ruled out, but no definitive evidence has been discovered yet. I hope you can be home soon, sweet Lindsey. Gracious, in some ways it feels like yesterday, in other ways, long, long ago. Still praying she will be found. Thank you for the up-dates grace-land. Happy 15th Birthday, Lindsey! Hoping and praying that you come home soon! The National Center for Missing and Exploited Children has released an age-progressed photo to show what Baum might look like. Scott said her age makes it difficult to guess what she would look like 4 years later "they did this a while back, the family didn't think that it looked like what they envisioned Lindsey to look like. They've done a new one, and it's pretty good - when I looked at it I thought it was how I would have imagined her to appear." Lindsey will turn 15 years old on July 7th, at the time of her disappearance she was 4-foot-9, 80 pounds, with brown hair and brown eyes. Lindsey’s mother Melissa, and brother Josh, have since moved out of the McCleary area. The age-progressed photo is expected to be released soon, visit www.missingkids.com for details. A $35,000 reward continues to be offered for information in the case. If you have any information in the case, please call 1-800-THE-LOST. Thinking of you Lindsey.. Praying you will be found soon..
Hello alismom I too hope Lindsey will be found. On Wednesday, aged-progressed posters of missing child Lindsey Baum will be added to Gordon Trucking trailers as part of the Washington State Patrol's Homeward Bound Program. Baum was last seen on June 26, 2009, in McCleary. She was 10 when she disappeared. Posters of Baum have been traveling around the country on 10 Gordon Trucking trailers since 2010. Members of Lindsey Baum’s family will be at the event at Gordon Trucking. Thank you to Gordon Trucking for having Lindsey's posters on their trucks since 2010!! And thank you grace-land for posting the article. There doesn't seem to be much information lately about Lindsey's case. You're not forgotten Lindsey! I'm so sad to post this because of previous rumor's this might be Lindsey. Wandering if anyone knows how long it takes for the dna tests? This find is very sad. When he pulled his crab pot out of the water about two miles off the coast, he discovered a human skull inside. Westrick and his crew immediately called authorities, who said they believe it belonged to a young person. It is unclear whether the skull shows evidence of blunt-force trauma. I don't know, madibabe. I think a lot of it may depend on how long the skull was submerged, the water temperature and other condiditions. I found an article about a case where remains were found submerged in cars in a lake in Oklahoma, and there was a bit of an opinion on how long it might take to get dna test results. I've included the link and a snippet for general information, not to be confused with Lindsey's case. I hope the skull can be id'd. Authorities cautioned Wednesday, however, that positive identification could take years. The state anthropologist, Angela Berg, will examine the remains. "Scientific identification of these remains will be attempted using anthropological and if necessary, forensic pathological methods," Chief Administrative Officer Amy Elliott said in a written statement. "Depending on the features of these remains and their state of preservation, identification can take anywhere from days to years. In some cases, if the DNA is degraded, positive identification using scientific means may not be possible. WESTPORT, Washington — A King County anthropologist has confirmed that a partial skull found in a crab pot near Westport, Washington, is human. A fisherman pulled it up Friday morning about 2 miles off the coast. The fisherman set the pot last week. Page created in 10.197 seconds with 21 queries.